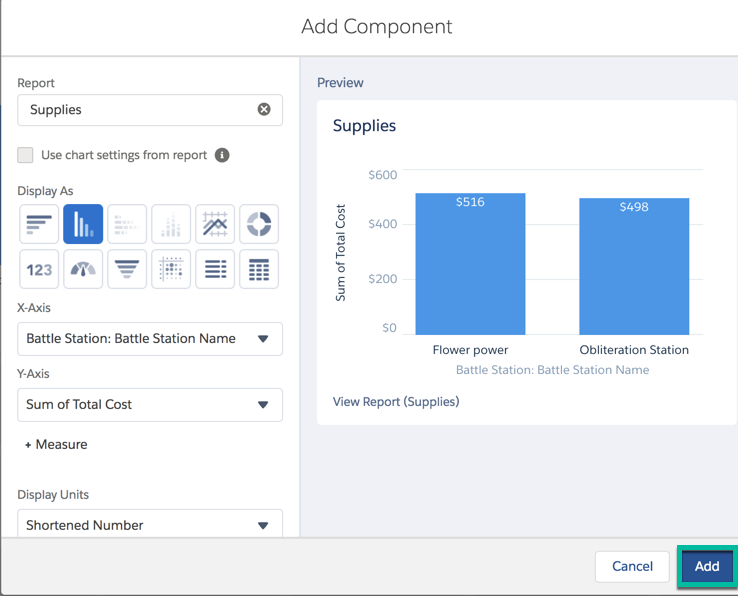 Create a Report for Supply costs. Create a Dashboard to display reports. Bosses love reports. It's a fact. A report in Salesforce is a list of records that meet the criteria you define. It’s displayed in Salesforce in rows and columns, and can be filtered, grouped, or displayed in a graphical chart. 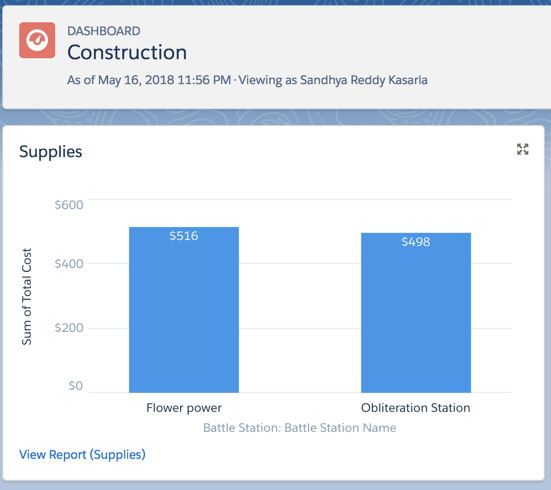 You'll create a report to monitor your supply costs for each Battle Station being constructed. Click the and select Battle Station Construction then click the Reports tab. Expand the Other Reports folder, select Battle Station with Supplies and click Continue. If you don't see the Battle Station with Supplies report type, go back to Setup and click Object Manager. Next to Battle Station, click Edit. Under Optional Features, check Allow Reports. Click Save. Then go back and create the report. Search for Quantity, Unit Cost, and Total Cost fields in the Add column search and add them as columns one at a time. Note: You can also drag the fields from the Fields pane, in the Battle Station with Supplies: Info folder in to Columns section. In the Add group search, enter Battle Station Name and select Battle Station Name.This will separate the report by individual Battle Station records. Open the menu on the Quantity, Unit Cost columns and select Summarize, then deselect Sum. Leave Sum as selected for Total Cost Column. Click Save & Run, enter Supplies for the Report Name and click Save. You should see something like the following with subtotals for each Battle Station. Your boss will love you and certainly give you the rest of the day off. Perhaps even buy you a drink in the Cantina? You can "WOW" the big boss even more by adding a number of reports to a dashboard for quick and easy viewing. Bosses love eye-candy! A dashboard is a visual display of key metrics and trends. The relationship between a dashboard component and report is 1:1; for each dashboard component, there is a single underlying report. Multiple dashboard components can be shown together on a single dashboard page layout, creating a powerful visual display and a way to consume multiple reports that often have a common theme, like number of exhaust ports unsecured, toilet paper usage per Battle Station, etc. Name the dashboard as Construction and click on Create. Click the +Component button on the top of the page and select the Supplies report. Select the Vertical Bar Chart component and click Add. Click the Save button and then Done.